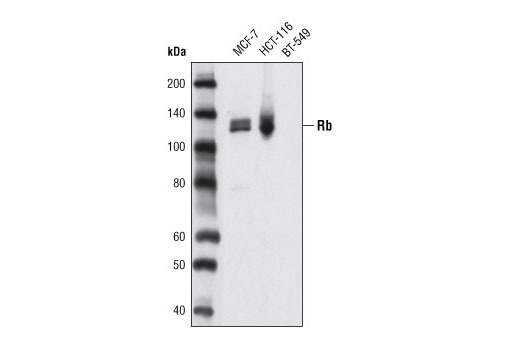 Western blot analysis of extracts from MCF-7, HCT-116 and BT-549 cells using Rb (D3D2) XP® Rabbit mAb. BT-549 cells do not express Rb. 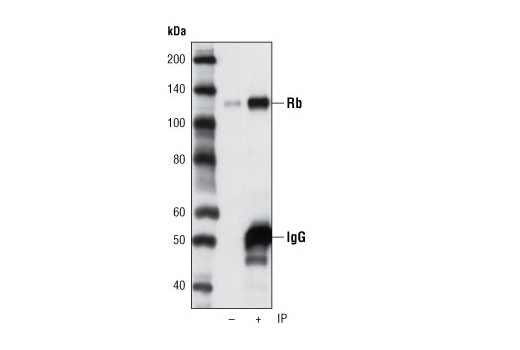 Rb was immunoprecipitated from Jurkat cell lysates using Rb (D3D2) XP® Rabbit mAb. Western blot was performed using the same antibody. Lane 1 is 5% input. Confocal immunofluorescent analysis of MCF-7 cells (right) and Saos2 cells (left) using Rb (D3D2) XP® Rabbit mAb (green). Actin filaments have been labeled with DY-554 phalloidin (red). 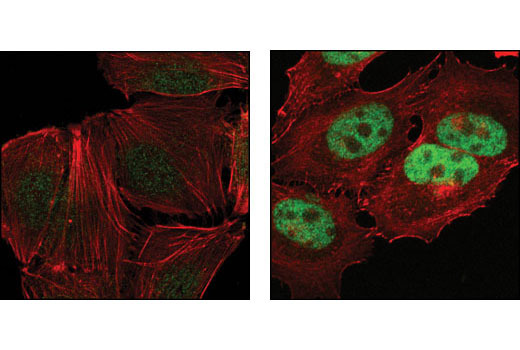 Rb (D3D3) XP® Rabbit mAb detects endogenous levels of total Rb protein. Monoclonal antibody is produced by immunizing animals with a synthetic peptide corresponding to amino-terminal residues of human Rb.